Scorpions occur in many countries of the world. Mostly the animals live in warm regions. In cold countries, on the other hand, there are hardly any scorpions. In Europe, scorpions live in the Alps and further south, and there is also a species in Austria and Switzerland. In Italy there are about 5 to 7 species of scorpions. According to our literature sources, only 2 of these species exist in the region of Tuscany. Of the approximately 2,300 known species worldwide, only a maximum of 50 species of scorpion have a poison that can kill humans. The scorpions found in Europe do not belong to these dangerous, very poisonous species. Although all scorpions in Europe have poison, a sting is usually not life-threatening. An exception can be allergy sufferers: A scorpion sting can, like a wasp sting or a bee sting, trigger life-threatening allergic reactions. According to our literature, however, this is rather rare. A stick is usually harmless. Local swelling can occur, for example. If you are stung by a scorpion in Tuscany or elsewhere in Italy, you should consult a doctor. The stings can be very painful. What types of scorpions are there in Tuscany and Central Italy? According to our research only scorpions of the genus Euscorpius exist in the middle of Italy. Most of the 17 Euscorpius species can be found in Europe. 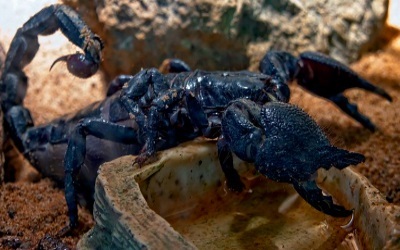 All Euscorpius scorpions have a rather weak poison. Of the 17 species, 2-3 live in Tuscany. Euscorpius italicus: This scorpion species occurs from France to Russia. In Italy the animals live mainly in the northern half including Tuscany. They also like to come into houses, you see them relatively often in Tuscany, also in cities. Scorpions of the species Euscorpius italicus rarely have a length of more than 5 cm. They are brown, also red-brown or blue-black. The underside is usually somewhat lighter. 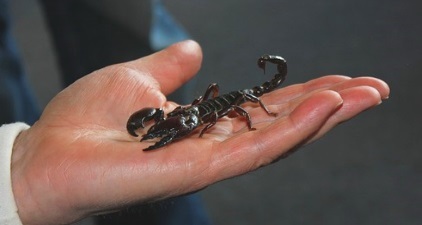 If you meet a scorpion in Tuscany, it is mostly an Euscorpius italicus. The poison of this arthropod (animal class in biology to which scorpions belong) is not very strong for humans. However, humans react to poison very differently, there are also allergies to the scorpion poison. Euscorpius flavicaudis: To our knowledge, these scorpions occur in Tuscany especially near the sea. Euscorpius flavicaudis also live in Spain and France, for example, and have been introduced by humans in some regions of Great Britain. This scorpion species is also found in houses and settlements. Stings are painful. It is not uncommon for nausea and vomiting to occur. We always recommend consulting a doctor if you are stung by a scorpion in Italy. Euscorpius flavicaudis are usually clearly bicoloured. The body with scissors is usually very dark, the legs usually light (usually yellow). By this characteristic you can distinguish the Euscorpius flavicaudis often well from the other Tuscan scorpion species Euscorpius italicus.